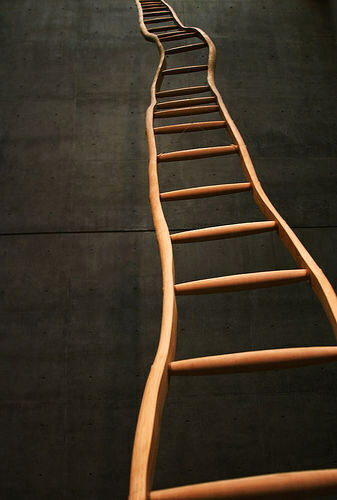 Do organisations and companies really still talk about the ‘career ladder’? Well, it seems they do. They still live on in the minds of people and, some companies and organisations do still promise rising talent a fast-track route up the ladder, in return for loyalty and extended service. Reading Leadership Freak’s post today, I was inspired by a much more meaningful metaphor for the 21st Century than the ‘career ladder’ – that of “The Climbing Wall”. Multi-directional While ladders are unidirectional, stifling and create ‘log-jams’, on a climbing wall you may move laterally as well as vertically. You may even choose to take a downward step in order to gain a more favourable foothold that will help propel you on an upward journey. Keeping Options Open The climbing wall allows you, at times, to have your feet in two different places. Having ‘a foot in two camps’ as you navigate your career, allows you to weigh up your next best move. This may temporarily be challenging, but It keeps your options open, and provides greater flexibility. We are increasingly seeing people operate in this way in the world of work, having more than one job, straddling disciplines, and changing career more often. The possible routes you can take on a wall are endless, limited only by your imagination, while the traditional ladder concept makes it difficult to change, typically forcing you to come off the ladder and start again on a new one. Cooperation You also have more opportunity to cooperate while on a climbing wall than you do on a ladder. People can more easily climb side by side, learning from a mentor perhaps, or with a coach who is simultaneously supporting and challenging. You can also see people who may be in your way, you can take detours and move around them, rather than sit patiently waiting for them to move up the ladder ahead of you. Breadth and Diversity Multi-directional “wall climbing” in organisations, connects you with so many more people, aiding diversity, creativity and collaboration. Of course, we need deep specialists, and, in some technical areas, such as medicine, engineering or law, it is important that people become ‘expert’ in their chosen discipline. However, everyone can benefit from a broad awareness of other functions and disciplines, helping them become even more successful in their chosen speciality in the long run. In today’s economic climate, possessing a breadth of skills and experience is vital, and being ready and prepared to move in different directions, as circumstances change, is an essential asset. Waiting your turn on the ladder, blinkered to what is going on around, is a dangerous strategy, leaving you exposed in a rapidly changing world. In evolution, those best able to adapt, survive. Being fleet of foot, multi-skilled and able (and willing) to change direction, are the attributes that will help people thrive in this rapidly-changing and increasingly unpredictable world. To discuss your future career aspirations and consider how you can enhance the flexibility, resilience and adaptability you will need to succeed, simply submit your contact details on the Contact Us page and I will be delighted to contact you for an initial chat. This entry was posted in leadership, talent and tagged career ladder, coaching, leadership, Leadership Freak, progression, promotion, resilience by louiscollinsblog. Bookmark the permalink. Hi Louis. Like you challenge to conventional thinking. My only comment is the underlying assumption (I think) that the only way is up! Wouldn’t it be interesting if careers were about broadening and deepening as well as growing up? Even better Charlie!! I was still doffing my cap to ‘upward’ being the general direction most people aspire to …. but you are quite right….broad and deep sounds good to me. 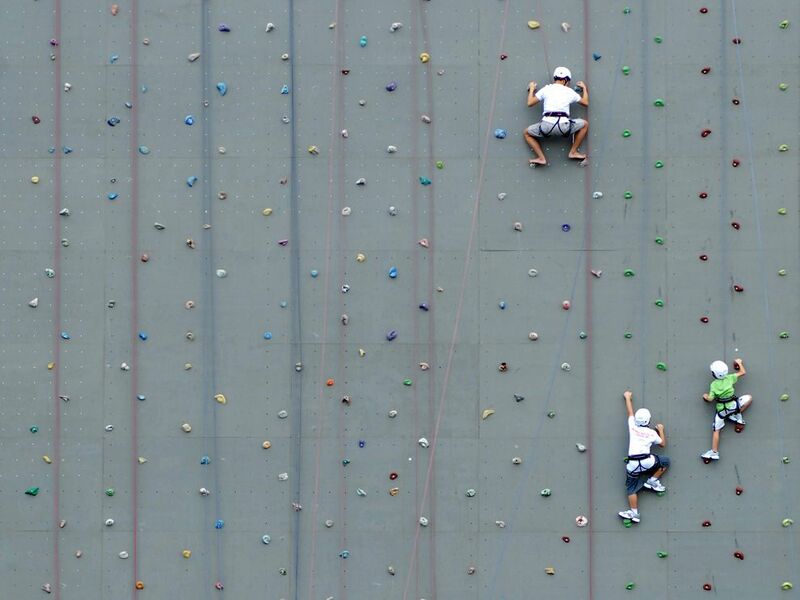 The climbing wall is a great way to think about careers. Today’s careers are too varied to look for a single path. Also, the life-long commitment to a single employer is unlikely. It is unreasonable to expect someone else to define a ladder or path for you. Great post, building on Leadership Freak’s thoughts, which is usually another great read! Up, broad and deep are definitely the ways to go as, in the public sector in England at least, it seems to me that people increasingly eschew greater responsibility/pay/promotion for a steadier commitment to making a difference, through areas of well-earned expertise and skill, at a pace and in a time-frame they can manage well. I also agree wholeheartedly with Allen that life-long commitment to a single employer is much less likely in the modern day. Great post. Particularly like what you describe as taking detours around those people you see as being in your way. Even in organisations that still have what we would recognise as a traditional route to the top many people consciously look for ways around and often this is by moving way outside of their ‘chosen career path’. This can only broaden their horizons and experiences which is what you want from those who finally reach the summit. Excellent metaphor, I very much enjoyed reading your article, thanks!